Florida's finest wine and food festival, Forks & Corks, which is presented by The Sarasota-Manatee Originals, celebrates its tenth year with a series of events throughout the weekend of January 27. PIER 22, the authentic waterfront dining restaurant, located in the heart of downtown Bradenton, is scheduled to host a special Forks & Corks Winemaker Dinner Friday, Jan 27 starting at 6:30 p.m. Tickets are limited and reservations are required. Cost is $100 + tax and gratuity. Guests of the Forks & Corks Winemaker Dinner will enjoy carefully selected varietals from the award-winning, Michael David Winery in Lodi, California perfectly paired with PIER 22 specialty creations. The PIER 22 & Michael David Winemaker Dinner is an intimate single-seating event with a wine selection presentation by Michael Phillips, a fifth generation winegrower and co-owner of Michael David Winery. Executive Chef Greg Campbell of PIER 22 will provide the housemade cooking explanation. The Original’s Executive Director Kate Atkin said, “Forks & Corks is a whirlwind weekend of great food, fine wine and fun!" The Forks & Corks Winemaker Dinner at PIER 22 is a social gathering where hosts and guests come together to share their passion for foodie culture, including a discussion of exceptional wines, scratch cooking, travel and much more! The dinner is an exclusive five-course meal with an additional passed-appetizer: Mandarin Glazed Scallop and a special dessert: Tiramisu and Macchinetta Espresso. See the entire David Michael Wine Dinner Menu here. With paid admission to the event, all attendees of the Forks & Corks Winemaker Dinner at PIER 22 will be entered to win a pair of tickets to the 10th Anniversary Forks & Corks Grand Tasting happening January 29 at The Ringling Museum. The winner will be announced during the dinner. "Forks & Corks events are a kind of tribute to the energy and enthusiasm delivered by the culinary wonders of Sarasota-Manatee, said Campbell." "At PIER 22 the evening is a delightful affair and quite a memorable experience for us and our guests." 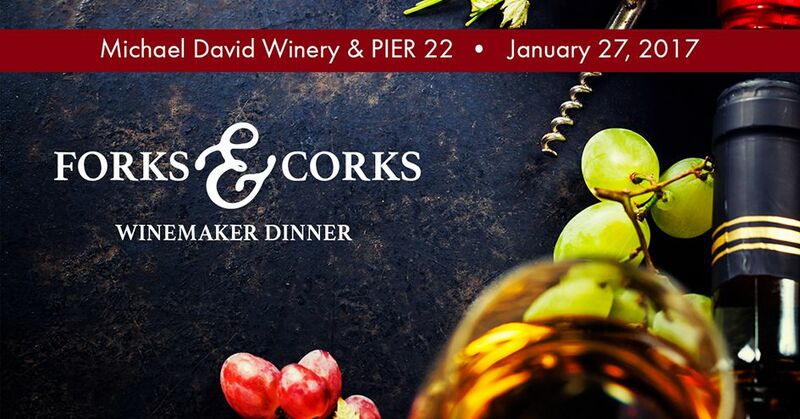 Call 941-748-8087 to reserve your spot at the Forks & Corks Winemaker Dinner brought to you by PIER 22 and Michael David Winery.